People who first encounter sign language often ask if deaf people around the world sign the same language. Frequently, they are surprised to learn that there are different sign languages in different nations worldwide, as well as variations of these languages. These variations depend on social factors such as region, age, gender, socioeconomic status, and race. One variation, Black ASL, has been recognized for years as a distinct form of sign language but only through anecdotal reports. This volume and its accompanying DVD present the first empirical study that begins to fill in the linguistic gaps about Black ASL. 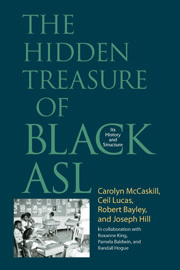 The powerful cast of contributors to The Hidden Treasure of Black ASL considered three questions in their study. First, what was the sociohistorical reality that made a separate variety of ASL possible? Second, what are the features of the variety of ASL that people call Black ASL? Third, can the same kind of unique features that have been identified in African American English be identified in Black ASL? This groundbreaking book and its companion DVD go far in answering these questions while also showing the true treasures of Black ASL. Carolyn McCaskill is a professor in the Department of ASL and Deaf Studies at Gallaudet University. Ceil Lucas is Professor Emerita of Linguistics at Gallaudet University. Robert Bayley is a professor in the Department of Linguistics at the University of California, Davis. Joseph Hill is an assistant professor in the Department of ASL and Interpreting Education at NTID/RIT in Rochester.